Cloud infrastructure presents an optimal solution for businesses who are looking for convenient and accessible tools that fit into their development processes without setting up their own infrastructure. Enabling testing on hundreds of real devices, cloud-based automated testing services can provide an almost instant reduction of downtime, which lowers costs, and helps deliver applications to the market faster. This paper will discuss different challenges in mobile application testing and will introduce advantages and disadvantages of manual testing as well as test automation. In addition, this paper will give an overview of different open source frameworks and suitable test infrastructures. 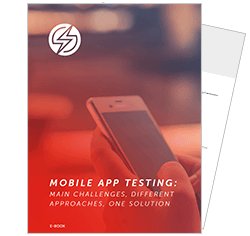 Finally, this report will suggest ways to optimize mobile application testing and show how Sauce Labs can overcome challenges and inefficiencies. One of the biggest challenges to mobile app development is the overwhelming number of different devices. User satisfaction, as expressed through ratings and reviews, directly influences the lifecycle of any mobile app and heavily influences its rate of success or failure. Therefore, assuring an app's compatibility and functionality across the greatest breadth of devices is crucial, as is designing different test scenarios to cover a multitude of instances. Used in the right manner, testing can be a powerful tool in keeping up with the fragmented mobile device landscape. This eBook will cover the crucial components of an effective testing strategy, one that will help you and your organization define custom-tailored tests cases for the application at hand, and define a workflow that streamlines testing.